Las Vegas Mobility Scooter Rentals - Victory 10 Four-Wheeler, Up to 400 Lbs. This scooter is the 2013 victory 10 a full size heavy duty portable scooter with a capacity of 350 lb ,this scooter is really nice as you can see, if you are between 300lb to 350lb and you are looking for something with style ,luxury and easy to transport and easy to maneuver this is the perfect scooter. Maybe you just want to cruise Las Vegas strip with style. The 2013 victory 10 is what a scooter of the 21st century should be. 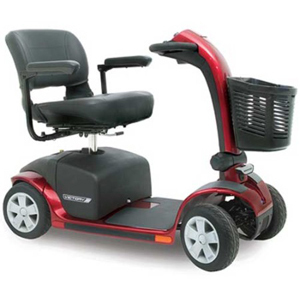 You will be able to get around in tiny spaces in casinos, hotels ,malls ,buffets ,etc ,thanks to its nice raise front, without taking a lot of room like the others old-fashion inexpensive scooters with high-back and head-rest, and a huge metal bumper that will make the old-fashion scooter huge ,you may have a hard time getting around , the huge bumper may get stuck in the wall elevators, corners, chairs, you can even hit somebody plus the Useless high-back and head-rest will only decrease your visibility especially in this crowded touristic city, you want to be able to see who is behind you when you are backing- up. This scooter is the best in this category with a max speed of 5.25 mph, and battery range between 10 to 15 miles. You don't need tools to disassembly the scooter and in less than 1 minute you'll have it in 5 pieces(heaviest part weighs 55 lb ) and take it any where you want even in a taxi-cap with the others old-fashion inexpensive scooters you will need a handicap taxi equipped with a ramp that will take a lot of room in the minivan that is why we recommend to get a regular taxi-cap and put the scooter in the trunk, that way you will have 5 seats available because getting a handicap taxi may take hours to get there and you may end-up over paying ,so keep in mind "get for what you pay for". We are proud to be the only company in Las Vegas where you can choose and reserve your scooter by model, and we only use modern state-of-the-art easy to maneuver scooters made by pride.